Happy Birthday Ellen Trout Zoo! 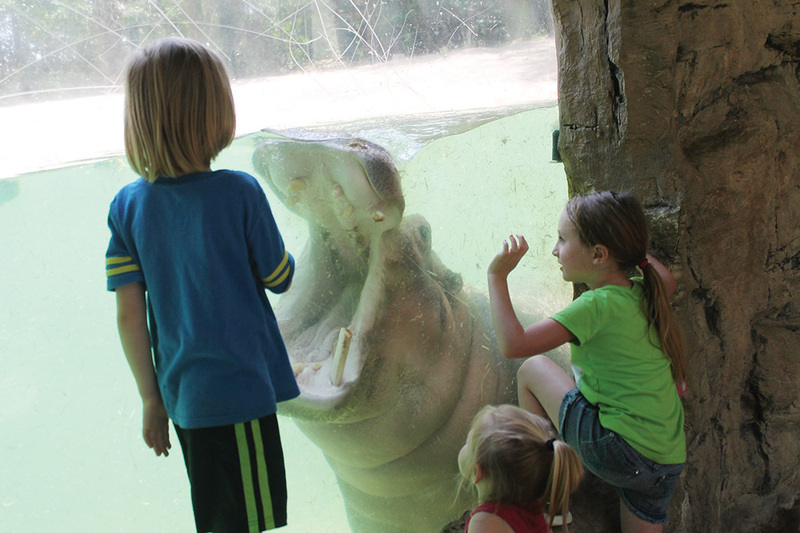 A hippopotamus entertains a group of children in the hippo-aquarium exhibit at the Ellen Trout Zoo in Lufkin Wednesday, June 14. The zoo celebrated its 50th anniversary on Saturday, June 17. Photo by Cheril Vernon / Messenger. LUFKIN – They say it all started with a hippo, a hippopotamus that is, more than 50 years ago. In the early 1960s, Lufkin businessman Walter Trout had a dream – to build a zoo in Lufkin. “Mr. Trout thought the children and people of Lufkin would enjoy a zoo and they shouldn’t have to travel to Houston or Dallas to do so,” Ellen Trout Zoo Director Gordon Henley told The Messenger during an interview Friday. At the time, Trout was president of the Texas Foundry and Machine Company, later known as GE Oil and Gas in Lufkin. “He was trying to get employees and those in his peer group to promote the zoo. Everybody in Lufkin thought he would be pouring money down a rat hole, but Trout was determined to do it anyway. So, he pushed forward,” Henley explained. As word of the possible zoo continued to spread, donations along with offers of animals for the zoo came in. “It was mostly hawks and owls, various snakes, raccoons and alligators – a lot of East Texas-based animals,” Henley said. During this timeframe, many people thought if the zoo didn’t work, they could just let the East Texas-based animals loose back into the wild. But Trout’s vision of a world-class zoo was bigger. One of Trout’s friends he served with on a Texas commission had a connection to the Dallas Zoo – which eventually lead to the donation of a hippopotamus, the zoo’s first large animal. Trout kept Hippie the hippo for a few days, and then the hippo was sent to the Louisiana Purchase Zoo in Monroe, La. temporarily until the official opening of the Ellen Trout Zoo on June 17, 1967. The zoo was named after Trout’s mother, Ellen Trout. The 50,000-gallon hippo-aquarium exhibit (featuring underwater and above-ground viewing) is still one of the zoo’s most popular attractions, currently featuring Jazi and Kakili. The Koi pond exhibit was Hippie’s old home. “The zoo never failed. The zoo has gone from seven acres to 20 acres and from about 200 animals to about 800 animals,” Henley said. The zoo, which started with a staff of six, has now grown to 30 employees. The zoo’s annual budget the first year was $7,500. Today, the zoo’s budget is a little over $2 million, according to Henley. Over the years, the Ellen Trout Zoo, now operated by the City of Lufkin with assistance from the non-profit membership-based support organization Friends of the Ellen Trout Zoo, has developed a handfull of master plans, including one in 1996, which concluded with a gorilla exhibit. “Now in our 50th year, we are now starting a new master plan to go from our current 20 acres to 160 acres. We hope to put that before the (Lufkin) city council in July. This includes the property that we are on now, but encompassing another 140 acres. In general, the zoo gets about 150,000 visitors a year. In 2016, out of the 73,700 people surveyed, tourists from 49 states, 441 Texas cities and eight countries visited the zoo. So far in 2017, the zoo has had 45 states represented. The Friends of the Ellen Trout Zoo has grown to 2,500 members, which represents 10,000 people. The zoo has been accredited continuously since 1983 by the Association of Zoos and Aquariums (formerly American Association of Zoological Parks and Aquariums). During that time initially, it was a voluntary accreditation, but now required for zoos. In the fall of 2015, Balam, the jaguar was born at the zoo, as part of a jaguar breeding program the zoo participated in. Balam is a Mayan word that means jaguar. The jaguar cub’s arm had to be amputated and the zoo dealt with wound issues as the animal recovered. The zoo is currently planning to build a special home for him, as he is currently housed in a closed exhibit. “We want him to have a permanent home and jungle here to live out his days,” Henley said. • The zoo currently houses more than 700 reptiles, birds and mammals from around the world. • Peafowl roam freely at the zoo. The males are called peacocks, which have the beautiful, colorful feathers. The females are called peahens. Babies are called peachicks. • One of the newest exhibits is the female Komodo Dragon exhibit. • The Tapir exhibit is a real train engine, built in 1924 for the Angelina County Lumber Company, which transported timber to the local mill. In 1966, the No. 110 engine was donated to the City of Lufkin and displayed at the zoo. • The zoo currently houses and helps conserve close to 50 different species of animals that are in a Species Survival Plan. • The zoo has jaguars, lions and Malayan tigers on exhibit. Right next to the zoo is the Z&OO Railroad, operated by the Lufkin Lions Club, which is not affiliated with the zoo or the City of Lufkin. The train rides, which started originally in 1969, takes about eight minutes and goes around the park and across Ellen Trout Lake. Train rides are offered from 10 a.m. to 3 p.m. on weekdays from March through August and 10 a.m. to 5 p.m. on weekends. When school starts in late August through March, zoo rides are offered from 10 a.m. to 5 p.m. on weekends and major school holidays. Special runs during the week for groups with advanced reservations. A ribbon-cutting and short 50th anniversary re-dedication program was scheduled for 10 a.m. Saturday, June 17 at the zoo for the general public. “The same person who cut the ribbon in 1967 is cutting it this year (Barbara Trout Corbett of Lufkin). She is the granddaughter of Walter Trout, founder of the zoo, and great-granddaughter of Ellen Trout,” Henley said. In addition, the Friends of the Ellen Trout Zoo hosted a 50th anniversary fund-raising beach formal event scheduled from 7 to 10 p.m. Saturday, June 17 in the Jaguar room and events room at the zoo. The event featured heavy hors d’oeuvres, complimentary drinks, and live entertainment by Sam Shupak and Band. The Ellen Trout Zoo is located at 402 Zoo Circle in Lufkin. The zoo is open daily from 9 a.m. to 5 p.m., including holidays and weekends. Admission is $7 for adults 12-59, $6 for seniors 60 and older, $3.50 for children age 4 to 11 and free for children under age 4. Group rates and school rates also are available. For more information about the zoo, call 936-633-0399 or visit the zoo on Facebook or www.ellentroutzoo.com.